The review article 'Recent progress in the use of renewable energy sources to power water desalination plants' will be published in Elsevier journal Desalination. Rapid population growth and industrial development have propelled water resources to the forefront of challenges facing modern societies. While water covers about two thirds of the surface of earth, < 1% is suitable for domestic and industrial use. Conventional fossil-fuel powered desalination techniques consume extensive amounts of energy and have highly damaging impact on the environment. Abundant cheap and clean renewable energy sources are a promising alternative for powering modern desalination processes. In this work we review latest developments in the renewable energy systems to power desalination plants. The review focuses on desalination processes powered by solar, geothermal, wind, and ocean energy. Towards the end, the work also outlines existing challenges and makes recommendations about future directions. 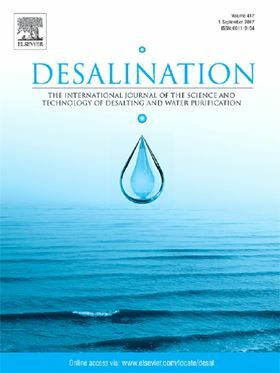 The article 'Freshwater production from the motion of ocean waves – A review' has been published in Elsevier journal Desalination. Flat ceramic membrane produced by combining clay and natural phosphate. Novel hybrid nanostructures were successfully synthesized and used to fabricate thin film nanocomposite membranes.